If you want a car that does the best burnouts, the Dodge Challenger SRT Demon looks like a good bet. It’s that time of the week again when Dodge reveals something new about the insane Challenger SRT Demon in the run up to its reveal at the New York Motor Auto Show in April. One of the most intriguing reveals was how it could be tuned to be a fast and furious road-going muscle car, or a dominating drag racer. This week, Dodge has focused its attentions on the latter, detailing how the Challenger SRT will feature a new dedicated Drag Mode allowing it to blitz across the strip faster than the Hellcat. While the brutal power of the Hellcat’s supercharged Hemi would have made it more than capable on the drag strip, the suspension and tuning was designed to strike a balance “between drag strip brute force, road course competence, and street car civility,” so it could never quite meet its potential as a drag car. With the Demon, however, there are no compromises – Dodge wants it to dominate in all areas. To make the Demon a formidable force on the drag strip, Dodge has fitted it with drag race-specific suspension and Bilstein adaptive dampers for the first time in a production car. 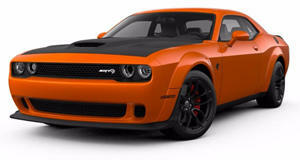 This setup maximizes the Demon’s weight transfer, traction and control, allowing it to do the one thing muscle cars are supposed to be really good at: tire-torturing burnouts, “because burnouts are fun, but they don’t win races,” Dodge acknowledges. We couldn't agree more. More will be revealed about the dedicated Drag Mode in the coming weeks. In the meantime, the automaker is playing numbers games with us again. A teaser image shows a time of “13.5=575@500” engraved in the Demon’s tire treads, which is likely to be another cryptic clue about the muscle car’s specification, just as previous images showing the license plate, serial and VIN numbers got people trying to decrypt more info about the Demon. What could this latest teaser be hinting at?